Baked Kibbeh is a Lebanese tradition and a favorite way to make kibbeh. This savory dish fills the kitchen with an unforgettably delicious aroma while it’s baking. 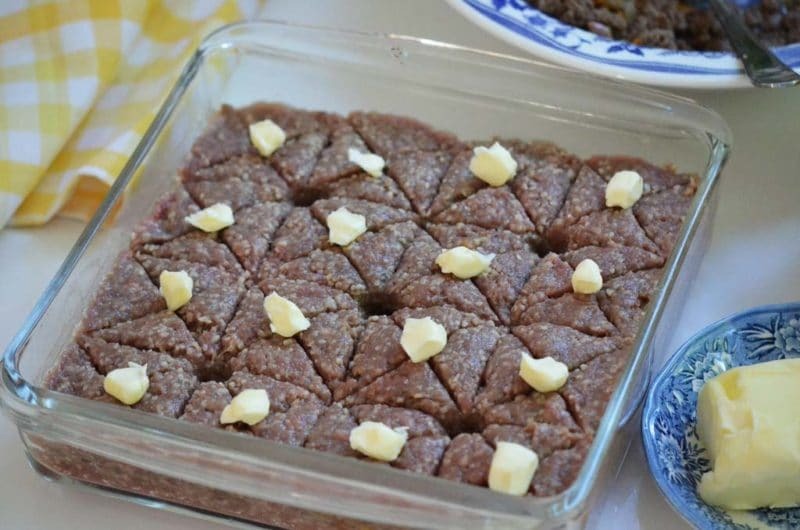 We like to eat kibbeh raw (kibbeh nayeh) the first day it’s made, then bake it in a sahnieh the next day. We aren’t the only ones making kibbeh this week…David Tanis at the New York Times baked a kibbeh sahneh yesterday using a recipe from the Lebanese grandmother of a friend of his. 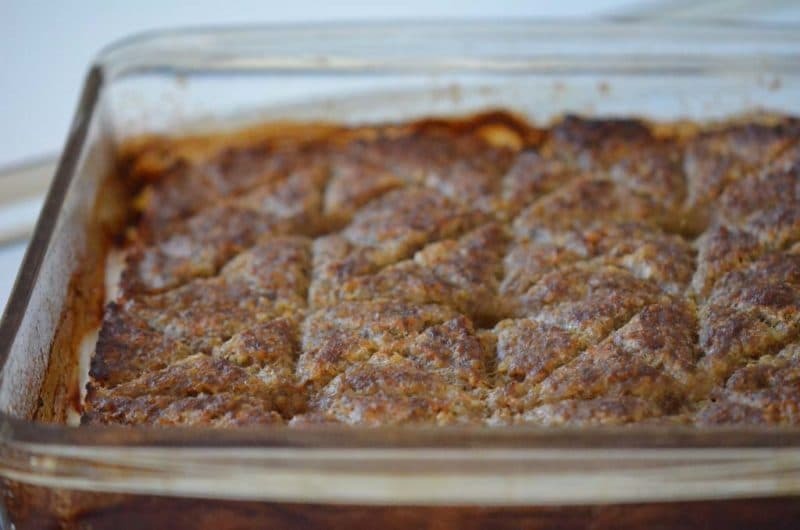 He considers kibbeh a transformation of meat loaf, and tough as it is for me to place “kibbeh” and “meatloaf” in the same sentence, I suppose it is—ground meat combined with a binding element (cracked wheat) and spices. It’s always fascinating for me to see variations on the way Lebanese dishes were prepared in my home growing up. David’s kibbeh is served with caramelized onions and pine nuts on top, a version of the househ that I noted with my raw kibbeh post yesterday. I’ve had baked kibbeh only with the househ stuffed inside, never on top and never with the onion so pronounced. It looked delicious. I keep thinking about the meat with meat combination that reigns in Lebanese cuisine: raw meat with cooked meat on top (kibbeh nayeh with househ), or baked meat stuffed with sautéed meat (kibbeh sahnee stuffed with househ), or even the appetizer version of raw kibbeh that I learned about this summer called frahkeh. For that you set aside a bit of your kibbeh meat and mix it with crunchy cracked wheat that has not been reconstituted in water, and up the cayenne quotient for added bite. The frahkeh is shaped into little torpedoes and passed around to whet the appetite just before a platter of kibbeh nayeh is served up. What is with the meat bonanza?! 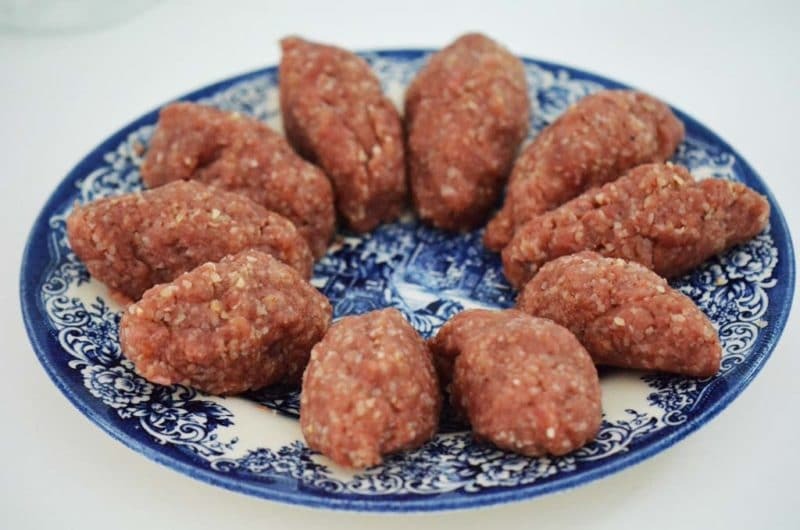 All I can say is that when you are cooking with exceptional ingredients such as the perfectly lean, nearly sweet meat used for kibbeh, you just can’t get enough. I also have the idea that these dishes represent a kind of strength. It’s something like what my Sitto used to tell me about the farm she grew up on, where not one thing was wasted when it came to cooking and keeping house. When they killed a chicken for a special dinner, they used every last bit of that chicken for more than one meal. So my thought is that kibbeh was probably served up infrequently and specially in the rather humble Lebanese mountain villages where my family comes from, so when they indulged, they indulged big. The animal protein nutrition likely needed to go a long way until next time. 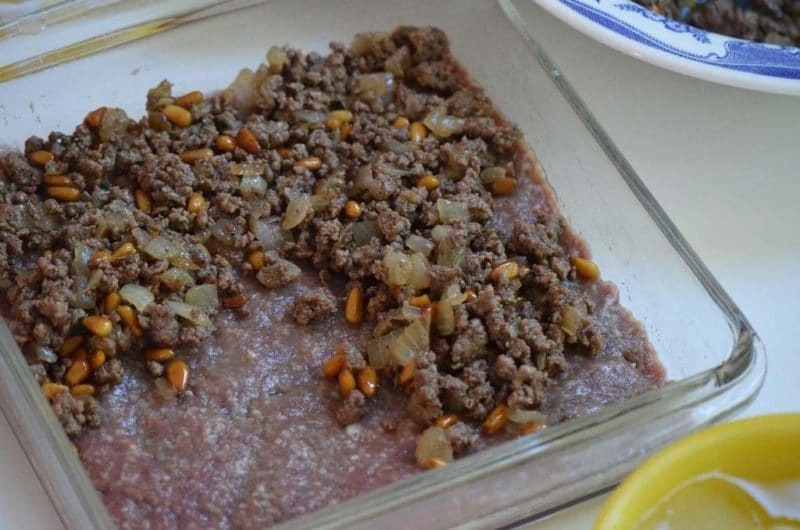 There are several ways to cook kibbeh after you’ve had your fill of the raw. I will admit that you can also skip the raw kibbeh if you must, and head straight for the baked or fried dishes—in which case, the perfectly sterile grind of the meat is far less of an issue. 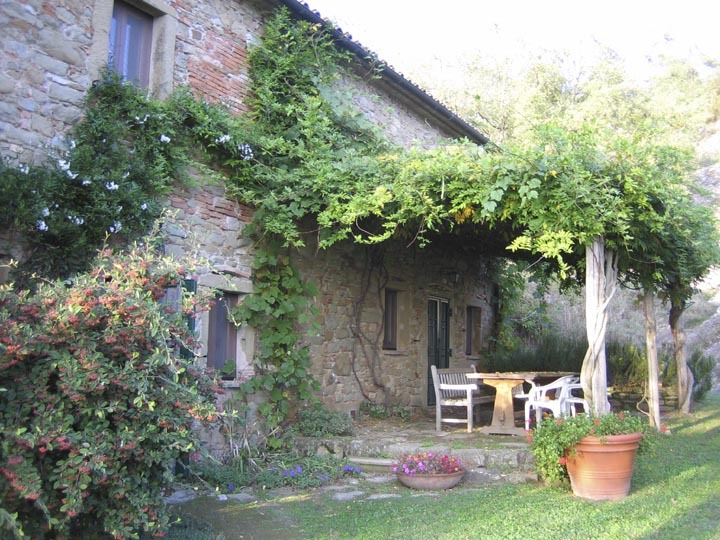 When I stayed at a villa in Umbria, Italy on a writing retreat with a group of food writers, one evening we each decided to make a special dish to share. I went on a quest that day to find the ingredients to make kibbeh, fried in little patties, for my friends. The cracked wheat was tough to tackle, but we found some kind of boxed tabbouleh (this is the one time I was happy to see the wheat trump the parsley for tabbouleh) and pilfered the bulghur from that. Telling the butcher in Italian that I needed fine ground meat with no fat whatsoever for Lebanese kibbeh was likewise surreal. I ended up with a more standard rather than finely ground meat, but because it was to be fried, it worked out fine. The flavor of the kibbeh was a great foil to the richness we had been indulging in all week—truffles we foraged ourselves (I have a framed certificate proving that I did hunt truffle), ricotta we made on the idyll of our lawn. But I digress. It’s so easy to when it comes to food, isn’t it? The simplest way to cook the kibbeh is to shape it into flat patties, unstuffed, and fry it in a few tablespoons of olive oil. But I love a sahnee, a.k.a. Lebanese meatloaf (ouch)–it’s a delectable dish that you can share if you are willing, or eat yourself in a variety of ways over several days: on a plate, with labne and a salad or tomatoes, or in the hand as a Lebanese-style wrap of thin pita bread filled with the kibbeh, labne, tomatoes, pickled turnips, and anything else you think would taste good. And don’t worry about getting the top of your sahnee cut like a stained glass window as my mother did in the photo below; simple squares will taste just as good. This kibbeh is made in layers with filling, as a sahnieh (in a casserole). Make it ahead and freeze the casserole raw, then thaw overnight in the refrigerator and bake as directed below. 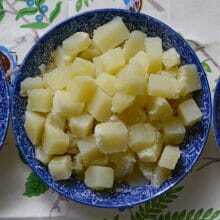 Or bake it ahead, refrigerate for up to two days or freeze, then reheat in the oven, thawed. Make the stuffing: in a large frying pan, heat the olive oil until hot but not smoking. Add the onions and about a half teaspoon of salt and sauté until soft. Add the ground beef and season with cinnamon, another half teaspoon of salt, and a few grinds of pepper. Cook until browned, breaking up the meat with a metal spoon into small bits as it cooks. Squeeze the lemon juice over the househ, taste, and adjust seasoning if needed. Stir in the pine nuts and set aside to cool. Coat a 9x13x2 inch baking dish with oil. Set up a small bowl of ice water where you are working and use the water to coat your hands as you flatten and shape the kibbeh. Use half of the kibbeh to form thin, a flat layer covering the bottom of the baking dish. Smooth the layer with cold water. Spread the stuffing evenly over the flat kibbeh layer. Using the remaining kibbeh meat, form another thin, flat layer over the stuffing and smooth with cold water. 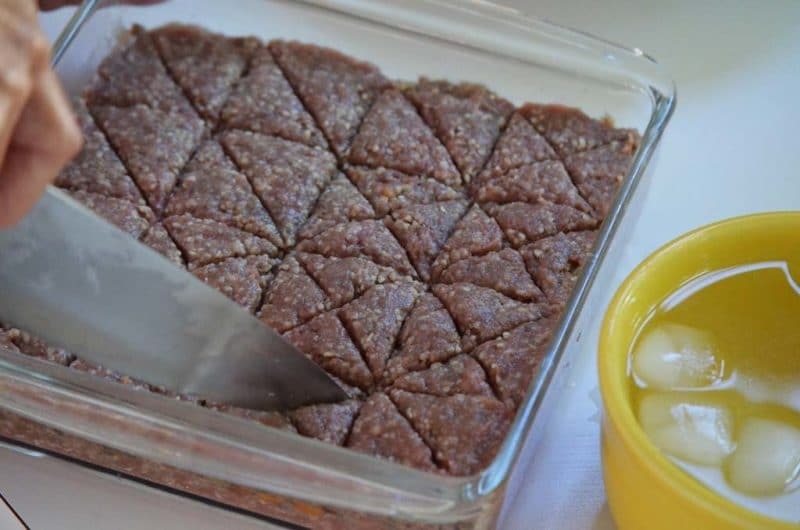 Score the top in squares (or the traditional diamond pattern) into the kibbeh, cutting through to the center layer but not all the way to the bottom of the dish. Place a dab of butter on each square—this adds a wonderful savory flavor and moisture to the kibbeh. Bake in the center of the oven for about 50 minutes, or until the kibbeh is deep golden brown on top (place the kibbeh under the broiler if needed), otherwise it looks more like a mundane meatloaf than the kibbeh we love. 31 Responses to "Baked Kibbeh: You say meatloaf, I say meatlove"
Thank you! Working on it….I will keep you posted…. Fantastic Joumana! I’ll head over asap!!! So enjoyed reading this; you are providing me with delicious bites of culinary education in a subtle way. It’s woven into stories and photographs; maybe like househ stuffed into kibbeh sahnee, if I understand you correctly? And pleasurably: my favorite line here: “What is with the meat bonanza?” Glad to be here to enjoy it all. Nancie, I love knowing that you are with me here . Yes–househ stuffed into kibbeh sahnee! Your presentation is as elegant as ever! Thank you for the recipes. Thanks for being here Gary! I found that if you can’t find bulghur you can use couscous as an acceptable replacement. My children actually like it better. It should also be mentioned again the the bulghur needs to be soaked, or I have seen water added to the mix and the wheat soaked up the water from the mix. As with most old school cooks, both my mother and grandmother went by sight and taste rather than measurement. The standard was a 50/50 mix of wheat and meat. by sight. It always seemed like a lot of wheat before it was mixed but always came out. We also add nutmeg and black pepper to the mix. Couscous, wow!! The old school cooks did it so much that they barely needed to open their eyes in the kitchen!! Thanks and loved your comment. Beef? Come on! It has got to be lamb!!! Beef is a cheap way to cut corners, it is a bastardization! No Lebanese I know would be caught dead using beef for Kibbe! I love your passion, Megan! Come on up to Michigan and you will meet many Lebanese who use beef for kibbeh…it is what I and many others in my hometown grew up on, even in restaurants here. That, I believe, grew out of the lack of availability of quality lamb meat year round. I live in the Upper Peninsula of Michigan. It is very difficult to find lamb up here. When you do find it, it’s very expensive, but I’m willing to pay for it when I can get it. Although I think kibbeh made with lamb is far superior, I’d rather have it made with lean beef than not have it at all. I live in Illinois just outside of Chicago and also have family downstate Peoria Illinois (Huge Lebanese community) and ALL of us use good beef instead of lamb Megan! ok– so i got back on the “kibbeh with stuffing” horse today–using your recipe…and while the taste was FANTASTIC– the layers, as always–did not stick together! i don’t know what i’m doing wrong, and it’s making me crazy!!!!!! i cut into the pan of beautiful, crusty baked kibbeh–and it falls apart… 🙁 help! Hmmm, I think that the kibbeh often wants to fall apart, and you just put it together on the plate. Maybe your pieces are a little too small? Also, the top and bottom layers of kibbeh shouldn’t be too thick. Press the top down into the househ layer too. I understand the crazy! Hope these tips help. Let me know! Thank you for the recipe. I am looking forward to your book. My grandfather was born in Haifa and immigrated to Dom Rep where he married. My mother carried on the tradition of cooking the Lebanese food my grandfather was so fond of. But she past 7 years ago. I am now trying to recreate the wheel in order to find recipes for those special dishes I so enjoyed. I do remember my mother used to add chopped fresh parsley to her meat filling. Is that not traditional? My mom was known for adding her “twists” to recipes. 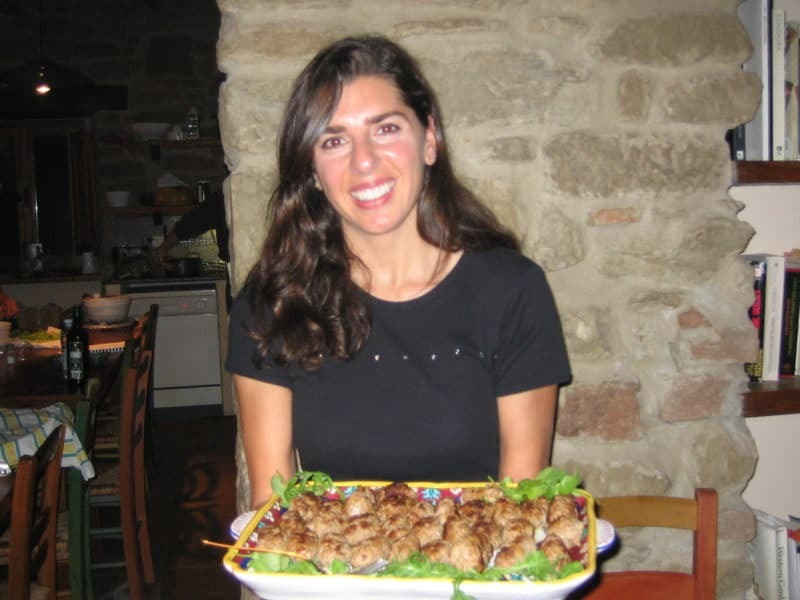 Thank you Raquel–I have seen fresh parsley in the kibbeh, but not often. How delicious. I will try it this summer! Keep up the great work carrying on the tradition of making our Lebanese specialties! After unsuccessfully seeking ground lamb from a number of sources, I was usually able to find a leg of lamb at Costco. Then I prefer to grind the leg of lamb myself using clean blades. I really like to taste the raw kibbeh mixture during preparation to assure there is the right amount of seasoning. When my daughter needed to be gluten free I replaced the bulgar with Quinoa. Excellent. How did it perform? Did you rinse and soak the quinoa before using it, the way we do bulgur? I stumbled upon your site today and felt a warm hug from family members long since past. 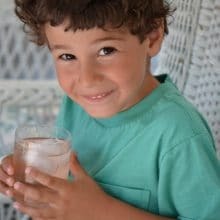 My mother was adopted into a family from the middle East and our recipes lay somewhere between Lebanese and Syrian cooking. My mother and I were two (very white) blonde haired, blue eyed girls in this colorful, loud, loving, wonderful family who shared all of these foods and traditions with us. I miss them terribly. Over the years we have tried many variations on the classic kibbeh (almost exactly as this recipe). However, our version is with allspice, not cinnamon. 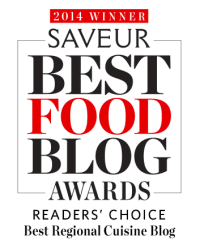 Is allspice a common spice for you? 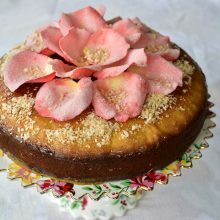 In addition, we have also done a gluten free version for a family member using quinoa, which must be soaked just as the bulgur, but for a longer period of time. We also even did a paleo version (grain free that happens to be low-carb friendly) using finely ground and soaked walnuts, still incorporating pine nuts into the middle filling layer. This added an extra buttery richness from the fat of the walnuts that was delicious! Thank you for sharing these foods of love with the world. I wish everyone could have grown up with them! How special in every way, Erica–thank you for sharing! Allspice does make its appearance–my aunt uses it quite often in addition to cinnamon. I wonder though too if it’s more typically Syrian? I love your kibbeh ideas with quinoa and the walnut version! So clever. I will try them! That means a lot Michael, thank you. Hi Maureen! I was wondering if you have any tips on making this ahead (Christmas Eve, for Christmas Day). Would you make it up to the point it goes into the oven, and then refrigerate and bake the next day? Or would you bake it and reheat the next day? Hi Clare–I’m making mine ahead too. I always freeze the sahnieh raw, and then bake it straight from the freezer. It may take a little longer to bake, but not by much (I’ve been making my sahnieh very thin and it comes out great that way). Wait to dab the butter on top until just before baking. I’m sure you could also refrigerate overnight rather than freeze, and that would work great too! Thank you so much for this recipe! My husband’s mom was Lebanese and I can’t wait to make this for him. I also just got your cookbook on Amazon and look forward to trying out more of your recipes. That’s so great Jamie, thank you! Let me know what you’re making!